Vincent van Gogh’s Starry Night seems to have a special appeal for scientists, who have recreated it using bacteria, among other media, in the past. Now scientists at Caltech have made their own tiny version of the painting — the width of ten pence piece across — out of folded DNA molecules. Some day the same technique could be used to build teensy biosensors, or for targeted drug delivery. It’s called “DNA origami”, and while many different kinds of shapes have been created using it, this is the first proof of concept that it’s possible to scale up and build large numbers of DNA based devices on computer chips. The Caltech team described their work in a new paper in Nature. 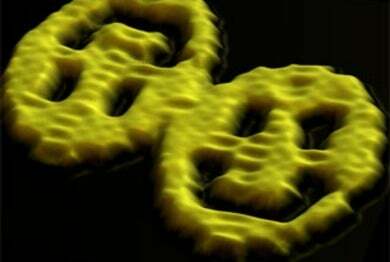 It’s been ten years since Rothemund made the first amusing shapes by folding strands of DNA. 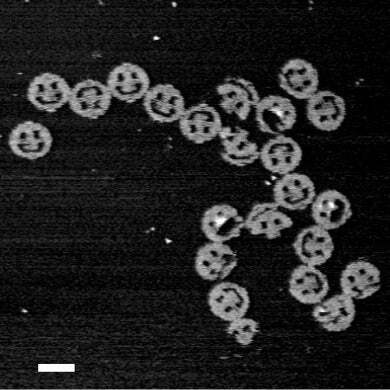 His nanoscale smiley faces, stars, snowflakes, and a miniature map of the western hemisphere were even displayed at the Museum of Modern Art in New York City in 2008, representing a true marriage of science and art. DNA takes the form of a double helix, and encodes all the genetic instructions for manufacturing proteins. It has four repeating chemical bases — known as A, T, G, and C — that are complementary, so A always pairs with T, and G always pairs with C.
To create his special shapes, Rothemund folded a single long strand of DNA back and forth into whatever shape or pattern he desired (determined beforehand with computer modelling), then stuck it all together at strategic points with “staples” comprised of shorter DNA strands. Each V-shaped staple had two “arms” with a base sequence that would bind to its complementary sequence on the longer DNA strand. Then he heated the long DNA strand in a saline solution, and let the whole thing self-assemble into the desired pattern. If this were ever to find any practical application, Rothemund knew he needed to figure out how to integrate his DNA origami with silicon microfabrication, and he collaborated with IBM scientists to do just that. By 2009, they had discovered that you could make sticky patches on a chip that were the same size and shape as the DNA origami. Simply pour the solution containing the DNA over the surface of the chip and the DNA molecules will stick to those matching patches. That DNA shape now acts as scaffolding, making it possible to attach other tiny components such as fluorescent molecules. Rothemund likens it to the pegboards typically found in sheds and garages to hold various tools, except this is a self-assembled pegboard where the tools find their own positions and stick there, held in place by DNA functioning like velcro. Rothemund and his colleagues have been refining this technique ever since. Over the last six years, he and a Caltech postdoc, Ashwin Gopinath, have shown that they can position their DNA origami on pretty much any surface used to make computer chips. The injected fluorescent molecules will glow at the tuned wavelength, thereby “lighting” the lamps. But location is key: the molecules will glow more brightly at some locations within the cavity than at other locations. By fiddling with positioning, Rothemund and Gopinath found they could create checkerboard patterns of “hot” and “cold” spots. That gave them the capability to reproduce other, more elaborate patterns. Gopinath chose to recreate “Starry Night” to demonstrate the technique’s power, because he’d always liked van Gogh’s work. Besides, he had just seen that Doctor Who episode (“Vincent and the Doctor”) in which everyone’s favourite Time Lord goes back to 1890 to help a fictional van Gogh battle an alien monster. Whereas prior work in this area used just a handful of these kinds of devices, Gopinath scaled everything up and stitched together 65,536 of them to recreate van Gogh’s masterpiece. The next step is to refine this technique even further, perhaps by using different fluorescent molecules or another type of light emitter, like quantum dots, since the ones they used for these experiments tend to burn out quickly. Plus, the colours aren’t as pure as one would like for certain applications, like optical or quantum computing at the nanoscale. Physicists are likely to be more interested in the potential for doing more fundamental experiments. For instance, an upcoming set of experiments will involve placing multiple emitters inside resonators and trying to get them to sync with each other — a phenomenon called “superadiance” that was first predicted by Robert Dicke back in 1952.